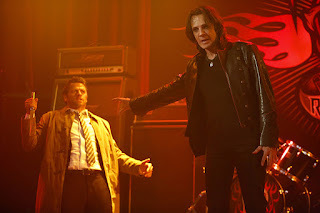 Supernatural 12x07 "Rock Never Dies"
Vince Vincente, we hardly knew ye. Not that I cared so much, because to be perfectly honest, I'm already over this Lucifer storyline. 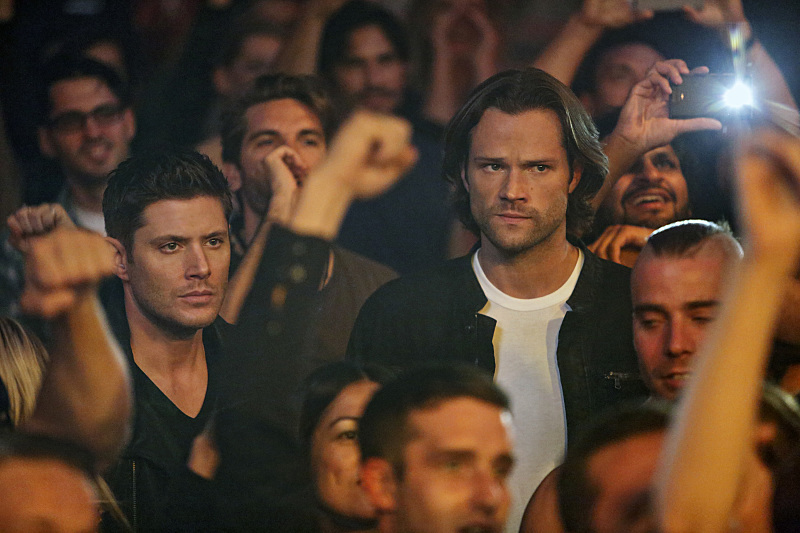 How many times do the Winchesters have to deal with Lucifer before he's gone already? We've been dealing with angels and demons since season four now, when is enough enough? At least we aren't having to watch angel politics again. ...yet?! Please no! Anyway! Let's get on to this week in particular. While Dean plays Words with Friends with his mom, Sam is researching the British Men of Letters. But they aren't the focus on this episode, oh no! Because Lucifer has found his way back from the oceanic depths and is able to give his faded rocker body another lease on life thanks to a fossilized feather of his. Yes, that sounds ridiculous, and yes, it's true. He decides he wants to get Vince's band back together to gain new followers. Okay? When they hear of this reemergence of Ladyheart, said faded rocker band, the brothers plus Crowley and Castiel team up and head to Los Angeles to find out if Vince is still possessed, etc. The answer? Yes. Duh. They do all have some difficulties in getting anyone to divulge where a secret show is going to be taking place, though. Because everyone in LA is narcissistic and only cares about fame and money, apparently, no matter how it comes to them. We have to endure quite a few scenes of Lucifer being "menacing" and making fans carve his name into their flesh and kill the head of his record label and members of his band, so on and so on. It's not clear what his point is - and that's kind of the point, apparently. Once the team manages to confront him, he basically whines a lot about God leaving and now he's not sure what to do. He doesn't have a grand plan. So... okay? Blah? He burns through this body before he's able to do any more bodily harm to anyone else, though Sam argues that though Dean might count saving all of the concert-goers as a win, he doesn't because the real Vince still died, and now they don't know what Lucifer is going to do next, only that it's "big" or something. Yup. That's about it. Next week - the midseason finale. - When Dean looked at the box of pizza only to find it was empty and was all subtly disappointed? Ha, too funny. - No but seriously, do any of you care about this Lucifer storyline? It's also quite clear they're going to have to eventually work with the British Men of Letters to take him down or something. It only seems logical since they are so ineffectual at doing anything to him on their own. Seriously, why do they ever bother when it's so obvious they're just going to get tossed around a bunch? - All of the shots of LA were kind of disconcerting, especially when combined with that 90210-type music. Especially since they clearly never actually shot in LA at all. 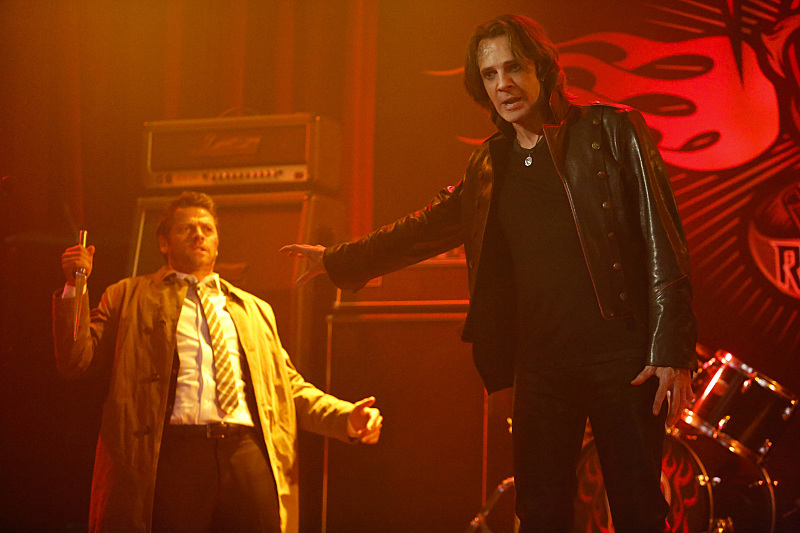 Dean: Still living out an '80s buddy comedy with Crowley? Crowley: We team up to save the world and them bupkis. You don't call, you don't write. Dean: I like history. Gladiators. Outlaws. Pirates. Hell, we're driving a piece of history right here. Sam: He could be an agent. Dean: Yeah, a third tier agent. Cas: At least I don't look like a lumberjack. Crowley: This is LA, I know a lot of people. Sam: We're not winning. We're losing slow.